If you're looking for great gift idea, you've come to the right place! Send this assortment of delicious, organic, gourmet cookies for birthday, corporate, or any occasion gifts. The beautiful colors and artful hand-decoration remind us how beautiful life can be! 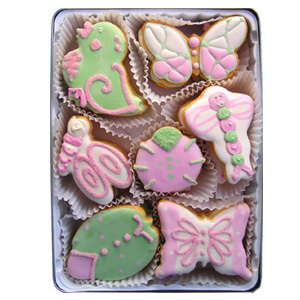 Decorated as precious birds, butterflies, bumblebees, and ladybugs, these cookie tins make a great gift idea.